A great side that is sure to impress! Coat 6 ramekins with cooking spray. 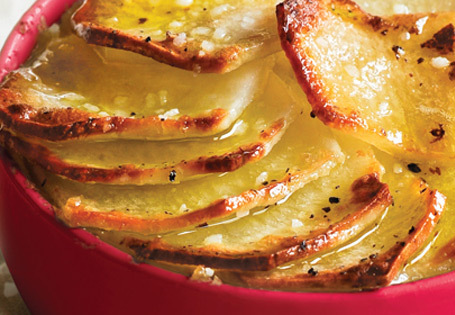 Divide sliced potatoes evenly among ramekins. Melt butter in a small saucepan. Add flour, Italian seasoning, salt and pepper and stir. Add heavy whipping cream, stir and bring to a simmer. Add the Swiss cheese, stir until melted. Once cheese is melted, place 1/3 cup of sauce into each ramekin over the potatoes. Cover each ramekin with aluminum foil. Bake in the oven for 50-55 minutes. Uncover for the last 5 minutes.